The new NanoStabilizer™ product is a proprietary blend of food-grade (GRAS) carrier oils, emulsifiers, and preservatives, all derived from natural sources. It contains the entire formulation necessary for producing translucent nanoemulsions of a variety of hydrophobic biologically active ingredients, including cannabis extracts (oils, distillates and isolates), pharmaceuticals and oil-soluble vitamins. NanoStabilizer™ has practically no taste of its own and yields highly translucent and fully water-compatible nanoemulsions with droplet sizes of about 20 nanometers, ensuring a high bioavailability, accelerated onset of action, and permanent product stability. Loaded with up to 50 mg/ml of cannabinoids and/or other active ingredients, these nanoemulsions can be easily sterilized by filtration and infused into a variety of water-based products without changing their appearance. Finished products made by our customers include CBD and THC-infused beverages (water, tea, coffee, beer, juice, etc. ), creams, oral and nasal sprays, tinctures, tablets, powders, edibles, and many more. Quickly and easily manufacture water-compatible translucent nanoemulsions loaded with up to 50 mg/ml of cannabinoids and/or other actives. Enhance the bioavailability and accelerate the onset of action. 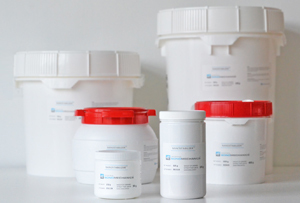 Ensure precise and reproducible therapeutic dosing. Infuse water with a strong medicinal dose while retaining optical clarity. Achieve droplet sizes of about 20 - 40 nanometers, ensuring translucency and permanent stability. Easily sterile-filter to remove any microbial contamination. Translucent nanoemulsions are hard to design – they require optimized carrier oil and surfactant formulations and well-adjusted ultrasonic exposure parameters (amplitude, temperature, exposure time, etc.). With our NanoStabilizer™, ultrasonic equipment, and easy-to-follow processing instructions, these R&D efforts are unnecessary. Follow the provided step-by-step instructions to produce the nanoemulsion. 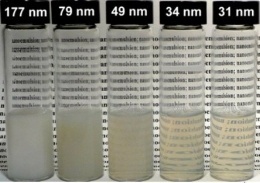 Dose the nanoemulsion into your finished product (e.g., beverage, cream, edible). In order to receive a quotation, please click the button below. Have questions or comments? Please do not hesitate to leave them below or contact us!